If it weren’t for the irresistible pull of adolescence, America’s multiplexes would be hard-pressed to find a comedy to play. Ted, the latest in the endless round of supposedly envelope-pushing comedies, finds a preposterously creative way to literalize the insistently popular boy/man split. Director Seth MacFarlane, of TV’s animated comedy Family Guy, has directed a movie about a man (Mark Wahlberg) whose best friend is a teddy bear (voice by MacFarlane). The story begins in 1985. As a boy, Whalberg’s John Bennett wishes that the teddy bear he receives as a Christmas gift could talk. John’s wish is granted, and the movie forges ahead. 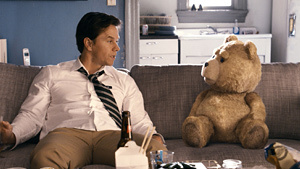 Now in his mid-30s, John lives in Boston with Ted, his unimaginatively named bear, and his girlfriend (Mila Kunis). At this point, MacFarlane unveils the movie’s single joke: Far from being a cuddly stuffed animal, Ted has matured into a foul-mouthed, pot-smoking adult who spews non-stop pop-cultural references. Disgusted with this perpetual juvenilia, Kunis’s Lori insists that John move on, leaving Ted behind. MacFarlane gets more than the expected mileage from what essentially is a one-joke movie built around Ted’s politically incorrect proclivities. The movie’s supporting cast is used to mixed effect. Joel McHale plays Lori’s obnoxious boss; Giovanni Ribisi portrays a nutcase who wants to kidnap Ted for his overweight son; and Sam J. Jones, who played Flash Gordon in the critically-derided 1980 movie, shows up as himself. The movie predictably (and unfortunately) sweetens toward the end, some of MacFarlane’s jokes miss, and some of the jokes really are more offensive than funny. Overall, though, Ted works better than it has any right to, and when it hits, it tends to hit big, even finding a way to work Fenway Park into an action-oriented finale in which MacFarlane tires his hand at a car chase. Bad idea.